• Build an iTunes library. • Customize playlists for individuals. • Develop and manage equipment. PHOENIX – At 87 years old, Maria still loves to dance. A resident of the Beatitudes Campus retirement community, she particularly enjoys listening to mariachi music on an iPod. Through a simple shimmy of her shoulders and rhythmic tap of her feet, Maria relives the tunes of Vicente Fernández, an artist popular in her day. 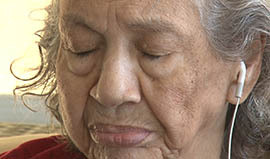 But this is a rare side of Maria, who has Alzheimer’s. Only minutes before, she was staring and fidgeting while Didi Cruz, an activities coordinator for the campus’ health care center, selected her customized playlist. Once Cruz presses play, Maria smiles. 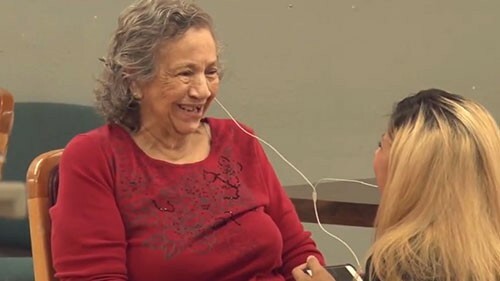 The Beatitudes Campus, which identified Maria only by her first name, is one of four Valley care facilities that participate in Music & Memory, a national program that uses second-hand iPods to bring music into the lives of those suffering from Alzheimer’s and dementia. Tena Alonzo, director of education and research at Beatitudes, said the program benefits anyone who has trouble thinking because most people have music in their lives. “Talking about quality of life for people who have dementia, it’s important we have a wide array of tools that are available to us,” she said. Created in 2010, Mineola, New York-based Music & Memory is now available at about 700 elder care facilities in 45 states and eight countries. The other Phoenix-area facilities are Hospice of the Valley and Pacifica Senior Living at Paradise Valley in Phoenix and Westminster Village in Scottsdale. Dan Cohen, founder of the nonprofit organization, said he chose to use iPods because live musicians were already available at facilities and he wanted to continue the music when they leave. Music & Memory supports individual facilities for a year to help them create personalized music programs for residents. Through three 90-minute webinars taught by Cohen, staff members at participating facilities learn how to incorporate iPods into the flow of their organizations and explore the therapeutic benefits of a customized playlist. Kerri Lopez, community relations director at Pacifica Senior Living, said her facility decided to add the program recently for residents who have difficulty communicating. Music helps to awaken their minds, she said. Pacifica is working with family members and a Boy Scout to solicit unused iPods so that all 84 residents can take part, she said. That twinkle was evident at the Beatitudes Campus as Maria smiled and moved her arms to the mariachi music, and Christine Parish, a nurse at the facility, said through each song she can see its meaning to her. “It makes you feel good when they feel good,” she said. At several retirement homes in Phoenix, music is being used to help with people struggling with Alzheimer's disease. Reporter Michael Gordon visited one facility to see how the program works. A calm falls over Maria's as she listens to one of her favorite mariachi artists during a Music and Memory session at the Beatitudes Campus in Phoenix.